Pai-Shau, the award-winning pioneer in tea infused haircare, today announced it is launching a new product. Something To BeLeave-In, the brand’s 13th addition to its luxury line, is more than just a leave-in conditioner. The miracle “multeatasker” also smooths, detangles, prevents frizz, amplifies color, enhances shine, and protects from pollutants and heat (up to 450°F). Along with revered product Biphasic Infusion, Something To BeLeave-In is now part of Pai-Shau’s Enhance Ritual collection. Something To BeLeave-In is sold in 120 ml units, which retail for $24 and can be purchased at Pai-Shau.com, Amazon.com and local salons (visit Pai-Shau.com for a salon locator). In celebration of the launch and to further support the organization’s continued commitment to cruelty-free products and animal welfare, Pai-Shau is donating $1 from every product purchased to animal rescue efforts, a cause it BeLeaves In. Something To BeLeave-In is the latest launch from Pai-Shau, which has offered its luxury tea infused haircare line since 2014. The innovative beauty brand’s Signature Tea Complex blends a variety of enriching teas: rooibos tea for strength, pu-erh tea for repairing, green tea for exfoliation, white tea for protection, and black tea for nourishment. Featuring a variety of vitamins and protective antioxidants, Pai-Shau is loved by consumers, stylists, and celebrities, alike. Recently styled stars include Emily Blunt, Morena Baccarin, Allison Williams, and Claire Danes. The company has also worked with A-listers like Nicole Kidman, Lady Gaga, and Amy Adams. Pai-Shau is the first of its kind tea infused haircare that treats both the hair and the scalp with a celebrated product line that promises ethically sourced ingredients and elite performance. All of Pai-Shau’s 13 luxury haircare products are infused with a vitamin-rich Signature Tea Complex, which includes five steeped teas: rooibos tea, pu-erh tea, green tea, white tea, and black tea. Together, they deliver a high concentration of vitamins and antioxidants to soothe the scalp and nourish from root to tip, creating intense moisture, lasting protection, and beautiful hair. 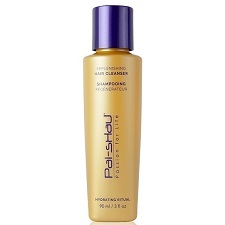 Pai-Shau products are cruelty free, vegan, gluten free, keratin safe, color safe, phosphate free, paraben free, and have no added sodium chloride—even the packaging is made of BPA free plastic. detangles, protects from pollutants and heat (up to 450F), prevents frizz, and enhances color, creating silky, hydrated locks full of radiant shine.